Haṭhayoga texts rarely mention tapas (asceticism). When they do, they usually define it as fasting or, in the case of the Haṭhābhyāsapaddhati, 'doing one's own religious duty' (svadharmācaraṇa). The techniques of self-mortification that have made Indian ascetics famous, such as standing on one leg for twelve years, lying on a bed of nails and sitting amidst cow dung fires, were not incorporated into systems of Haṭhayoga and some texts, such as the Haṭhapradīpikā, explicitly reject any practice that afflicts the body (kāyakleśa). It seems that the yogin has his body turned upside down (i.e., legs pointing towards the sky), as in the Haṭhayogic mudrā called viparītakaraṇī. However, in tapakār āsan, the yogin places his right shoulder on a piece of hanging rope to launch himself into the inverted position. 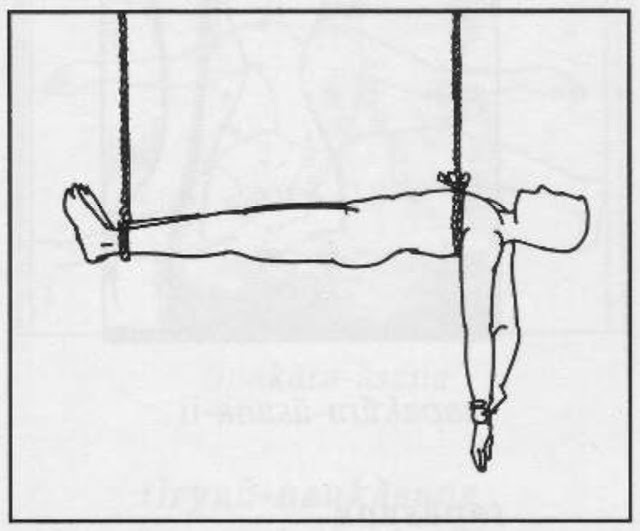 He then secures his body upside down by holding the rope with his feet. Interestingly, the beginning of the description of tapakār āsan refers to a frame (hiṇḍolan), from the centre of which the rope is suspended. Unfortunately, the text gives no details and one might wonder how such a frame was constructed. 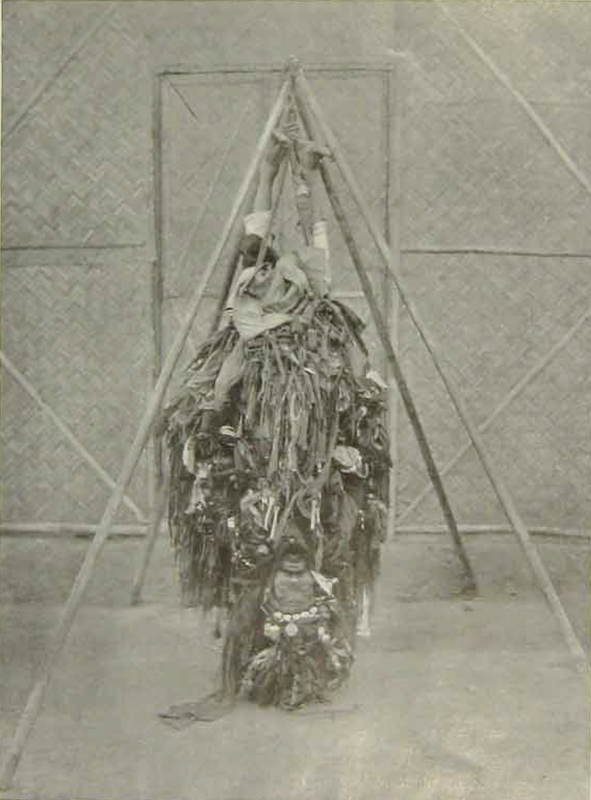 A photo of an 'Urdhamukhi' ('one whose face is downwards') was reproduced in John Campell Oman's The Mystics, Ascetics, and Saints of India (1905: 46).3 This practice appears to be very similar to tapakār āsan because it includes the use of a frame and a rope hanging from its centre. Tapakār āsan is depicted in an undated illustrated manuscript (perhaps, late eighteenth or early nineteenth-century) that colourfully represents the āsanas and mudrās of the Jogapradīpyakā. This manuscript is held in the British Library (Add. 24099) and its illustrations of eighty-four āsanas have been published by Gudrun Bühnemann (2007). 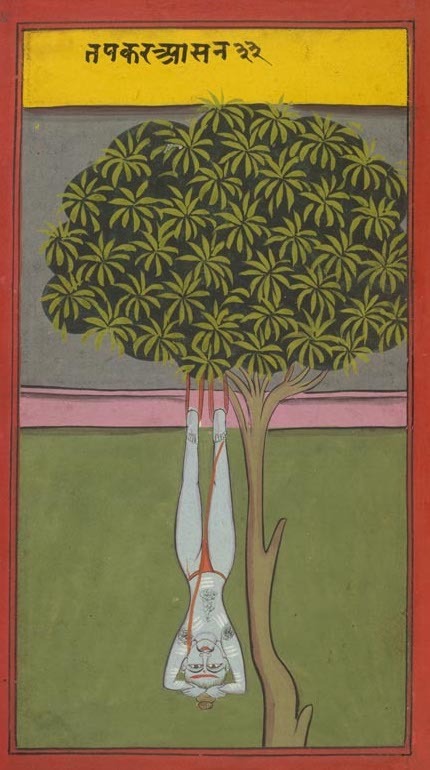 In this work, the artist depicts the yogin in tapakār āsan suspended from a tree branch, which is another plausible way of executing this practice. It is clear that tapakār āsan is not viparītakaraṇī in the Jogapradīpyakā. The practice of viparītakaraṇī (viparitikaran in Braj) is taught in the section on mudrās (verses 561-71) and it resembles the shoulderstand of modern yoga in which the yogin's head and shoulders remain on the ground, while the legs are lifted into the air. 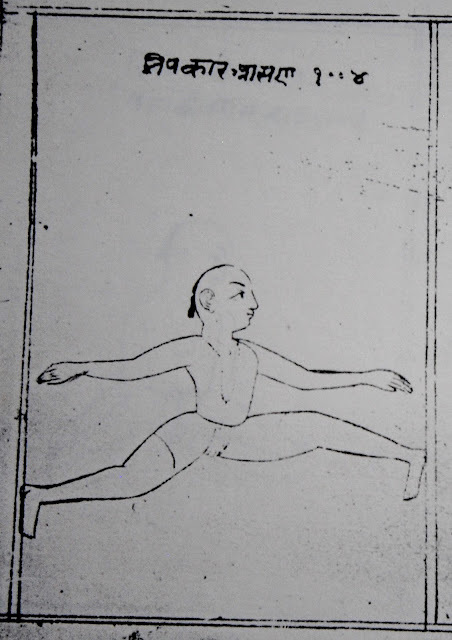 Another illustrated āsana manual called the Yogāsanamālā includes most of the āsanas found in the Jogapradīpyakā and was probably composed in Rājasthān in the eighteenth-century. Therefore, one would expect to find tapakār āsan depicted in it. However, there is no clear representation of this āsana in the Yogāsanamālā. Instead, one finds towards the end of the text a posture called tipakār āsan, which appears to be a corruption of tapakār āsan. Nonetheless, it is difficult to see how the illustration, which seems to represent the side splits, might be related to the description of tapakār āsan in the Jogapradīpyakā, because it does not resemble an inversion in any way nor are ropes or a frame included. Ms. R635Y8 folio 105 recto. The Yogāsanamālā provides no textual description of tipakār āsan. One wonders whether it is a different āsana altogether to the tapakār āsan in the Jogapradīpyakā or whether it was a mistaken interpretation of the Jogapradīpyakā’s description. It should be noted that descriptions of āsanas can be the most difficult material in yoga texts to understand. 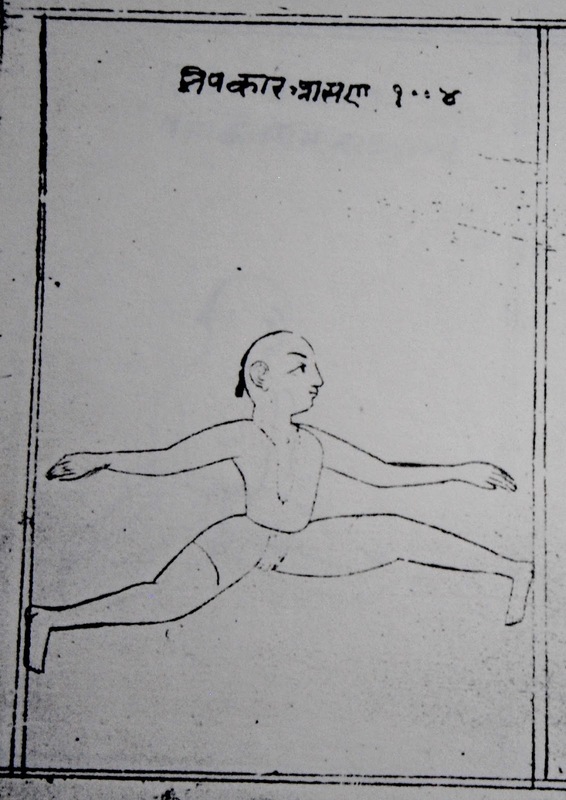 The challenge of this type of work can be seen in the illustration of the Jogapradīpyakā's tapakār āsan in the Encyclopaedia of Traditional Asanas (2013: 315). Here, the practitioner of tapakār āsan isn’t inverted, but suspended in a horizontal position with the ropes around the feet and shoulders. The ambiguity in the Braj Bhāṣā description might account for this type of misinterpretation. 1 The syntax suggests that this action is done the other way as well. 179a hiṇḍolana (a swing) appears to be a variant spelling of hiṇḍola, hiṇḍolā or hiṇḍolanā. In this case, it seems to mean the frame that supports the rope. 179a khaḍā ] conj. Nirājan Kafle : kharo Ed. 179b rāsi (rope) appears to be a variant spelling of rassī or rassā. 181d jugati appears to be a variant spelling of jukti. 181d vidhi ] emend. : vindhi Ed.182a pahoco (wrist) appears to be an alternative spelling for pahuñcā. 3 I would like to thank James Mallinson for bringing my attention to this photographic plate of 'An Urdhamukhi Sadhu'. Jogapradīpyakā of Jayatarāma, ed. Maheśānanda, Śarmā, Sahāya and Bodhe. Lonavla: Kaivalyadhama Śrīmanmādhava Yogamandira Samiti, 2006. Yogāsanamālā, photocopy (R635Y8) at the library of the Kaivalyadhama Yoga Institute, Lonavla. Several stamps indicate the Rajasthān Prācya Vidyā Pratiṣṭhān, Bīkāner. Eighty-four Asanas in Yoga: A Survey of Traditions (with Illustrations). New Delhi: D.K. Printworld. Gharote, M. L., Jha, V. K., Devnath, P., Sakhalkar, S. B., & Lonavla Yoga Institute. 2013. Encyclopaedia of Traditional Asanas. Lonavla, Pune: Lonavla Yoga Institute. The Mystics, Ascetics, and Saints of India. London: T Fisher Unwin.